A crisp, dry fermenting yeast that allows the inherent fruit character to come through and dominate the profile. 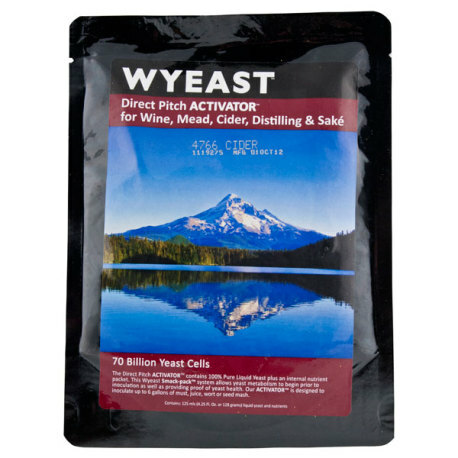 The 4766 Cider yeast strain is a crisp, dry fermenting yeast with a big, fruity finish. Really helps to create a nice balance for all types of apples, pears, and other fruit. Allows character of the fruit to come through and dominate the profile. Hello .. Very pleased with the Cider yeast that I purchased from your company... Followed the instructions on the package and bags expanded as advertised .. Let temperatures of yeast and Cider to get to room temp and pitched my yeast took about 8-10 hrs to start off 2 days and they were going like gang busters !! Went for about 4 -5 days like that and then started to mellow out .. Can't wait to see how the Cider comes out I'm sure it will be great.. Thanks, guys for the great customer service as I spoke to you about the fermentation and you asured me everything is going great.. Thanks again, Bob.